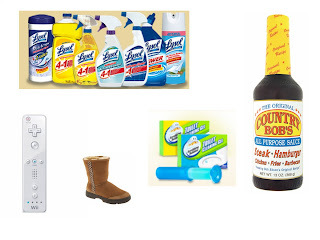 Lysol has $10 worth of coupons by clicking here. Register for a Scrubbing Bubbles Fall Pack here. Free Country Bob's Sauce here. Borders 30% off of any one item using code BRT6505Y. Excludes electronics, periodicals and gift cards. Wii remote for $27.00 at Dell - perfect for my Wii fit game giveaway! Ugg Australia Ultimate Tas Short Boot for $112.90 at Nordstrom. Dairy Queen has $1 off Blizzards for the month of September once you join the Blizzard Fan Club.